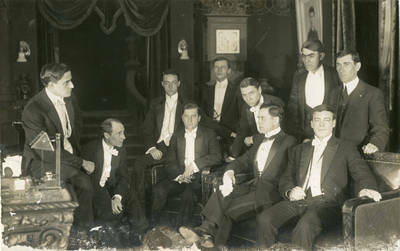 Formal group portrait of Thanhouser men in tuxedos, ca. 1915. W. Ray Johnston sits on the desk. He was the assistant to Charles Hite. Listed on verso: Ray Johnson, Ernest Ward [? ], Frank Grimmer, Carl Gregory, Sid Bracey, Harry Benham, John Kellette, Frank Farrington, and Harry Dull.